Food trucks — like Rubamba, above — have overtaken the Elm City. The Caseus food truck, one of the first in New Haven, opened four years ago. Photo by Marisa Lowe. New Haven foodies these days have plenty of reasons to rejoice. Food trucks and carts have maintained a presence in downtown New Haven, but their numbers have grown over the last several years. Many of the trucks cater primarily to the Yale community, which seems to have embraced the street food culture. When the Caseus cheese truck opened four years ago, New Haven’s street food scene was very different. “We were definitely one of the earlier trucks. There are significantly more trucks on the road now than when we started,” said Tom Sobocinski, co-owner of Caseus. Since then, student demand has increased significantly, although many believe the food truck market is not yet saturated. Many food truck owners agree. Bruce Bonini, owner of Bubba’s Road House, a cart that normally occupies York Street outside of Trumbull, would like to see even more food carts open for business. “I love competition. I want to turn this area into a food court, so everyone will come here,” he said. Sobocinski expressed similar sentiments. He said many food truck owners are actively planning to park together at certain city events in order to attract families and groups of friends. Street food vendors attract customers with different tactics than their brick and mortar competitors. Sobocinski said the truck’s social media presence is “huge.” The Caseus food truck has more than 4,000 Twitter followers, and the account regularly alerts followers to the truck’s location. vBonini, on the other hand, chiefly advertises by “word of mouth.” As Bonini and Evans have been in the food vending industry for less than a year, they are building their networks and are looking to further incorporate social media into their advertising strategy. The high demand encouraged “Ricky D.” Evans to open a barbecue food truck. “Yale is a very highly populated tourist attraction,” he said, explaining that the campus sees “a lot of foot traffic” that supports the food truck industry. Evans opened his business three months ago, and he has parked on York Street between Chapel and Elm for the past three weeks. Although New Haven does not cap the number of permits available to street food vendors, Evans said that joining the industry can be difficult. “It wasn’t easy. Initially I wanted to get a smoker on my pick-up truck, but the health department wouldn’t approve of it,” said Evans. 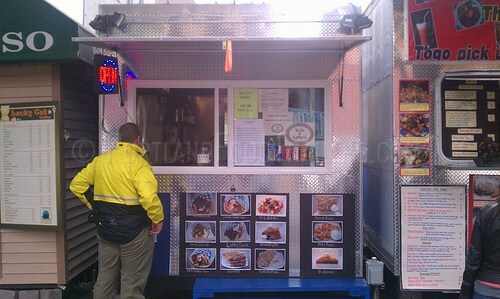 To open a food cart or truck, an owner needs a vending license from the city’s Building Department, which costs $200. Cart owners also must pay $280 per year to the Health Department and pass health inspections. Although street food vendors benefit from their mobility, they often face challenges in finding suitable locations. Sobocinski noted that parking a truck can be difficult in downtown New Haven’s small spots. In addition, carts and trucks must stay dozens of yards away from brick and mortar restaurants, and trucks are typically not allowed to stay in the same parking spot for more than two hours at a time. The growth of the food truck industry has engendered some pushback from owners of storefront restaurants. Steven Berry, an economics professor at Yale, said in an email that the restaurant owners may gripe about the relatively low taxes food vendors pay when compared to the high property taxes facing brick and mortar establishments. “It is possible that the trucks are ‘crowding-out’ some lower-price lunch places that might otherwise open,” said Berry. Evans said that he receives “a lot of grief from other restaurants.” While Bonini and Sobocinski acknowledge that there is some opposition to street food vending, both said they do not see it as a significant concern. “We do hope the city will embrace the truck movement,” Sobocinksi said. The Caseus Cheese Truck was featured on “Man v. Food Nation” in 2011.